Passengers traveling on Cunard Line's Queen Mary 2 have the option of taking a virtual journey to the stars in addition to their physical journey across the water. The ship has the only planetarium at sea. Allied with this feature is a relationship with the Royal Astronomical Society through which guests can learn from and interact with noted astronomers who actually practice in this field. 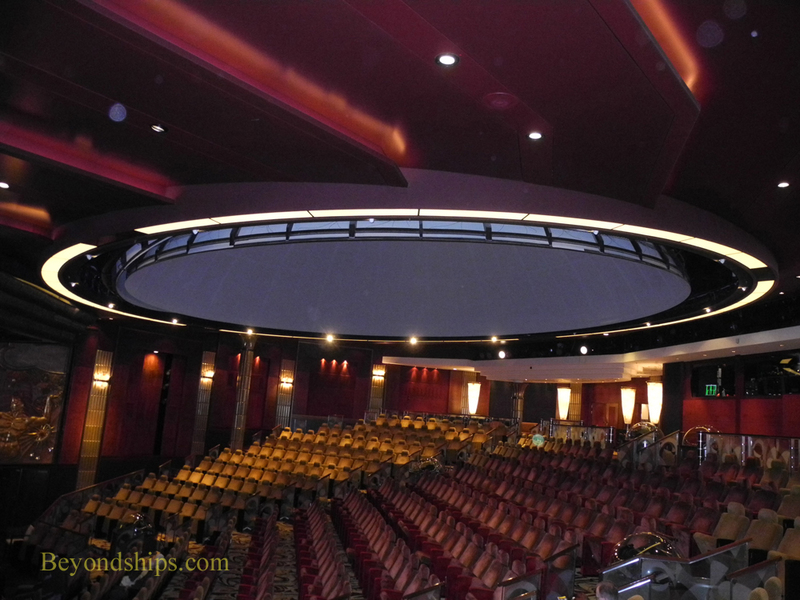 The planetarium is located in QM2's art deco inspired Illuminations theater. Suspended over the central section of the theater is a large dome, which can be lowered down over an area that encompasses approximately 150 seats. These seats are built so that guests can lean back and look comfortably upwards. Computerized projectors located around the theater combine to project an image of the night sky or of outer space onto the dome. Because the dome is curved, the views projected appear to be three dimensional. Cunard worked with New York's American Museum of Natural history Hayden Planetarium to develop four short programs for QM2's planetarium. Narrated by the likes of Tom Hanks and Harrison Ford, these programs give a perspective on Earth's place in the universe and take passengers through the cosmos on a search for life. Because seating is limited, admission is by ticket only. However, the tickets, which are distributed the morning of the day that the program is to be shown, are free. Inasmuch as QM2 has an international clientele, there are versions of these programs in several languages including Spanish and German. One of the Planetarium projectors. The RAS program is multifaceted. First, there is a series of traditional-style enrichment lectures given in Illuminations. For these, the entire theater, not just the planetarium section, is utilized. Although Illuminations has a seating capacity of 500, it is often difficult to find a seat for the astronomer's talks. Left: Dr. Crowe speaking in the Illuminations theater. 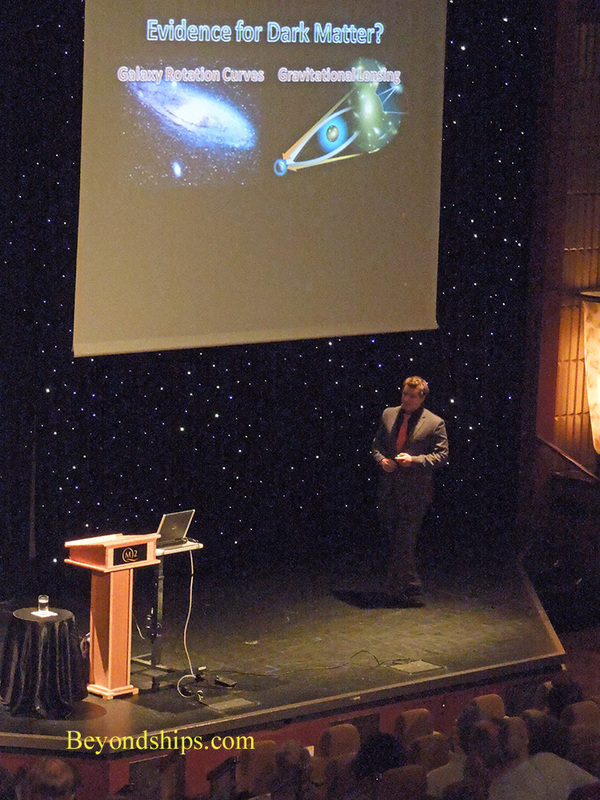 The RAS speakers also conduct “stargazing sessions.” These are held outdoors at night on QM2's top deck. In order to make these sessions a more personal experience for the guests, participation is limited to about 25 persons a session. As with the Planetarium programs, admission is by ticket but once again there is no charge for the tickets. Of course, whether you can see the stars from the open deck depends upon the weather. Consequently, the stargazing sessions cannot take place when it is cloudy or when there is a storm. 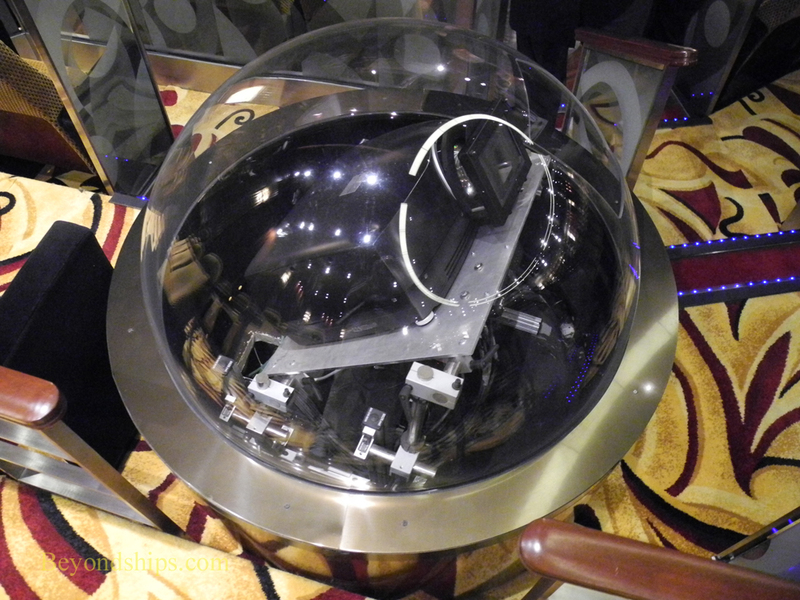 The astronomy program on Queen Mary 2 is not atypical of the ship's enrichment program. QM2 often offers enrichment and entertainment programming that is not ordinary cruise ship fare. (See articles on QM2's song writing program, Julliard Jazz program; Royal Academy of Dramatic Arts program, Beatles celebration). Such programming appeals to the sophisticated travelers that frequent Cunard's flagship as well as to people who are looking for something beyond the norm in sea travel.